Giant Hogweed is related to the carrot family and has flowers that form a flat white umbel shape. As a mature plant, Hogweed can reach 15-20 feet, dwarfing Cow Parsnip, which looks very similar an is also in the carrot family but only reaches 6 to 7 feet in height. 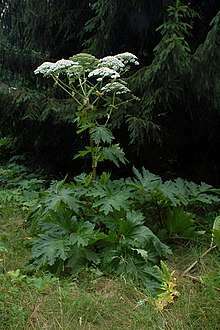 Cow parsnip can cause some photosensitivity, and in fact several plants in the family have sap with phototoxic compounds. In Hogweed the phototoxic compound is concentrated, and since this weed is so big the splatter from cutting it can be wide spread. Both serious burns and permanent blindness have resulted from cutting Giant Hogweed without proper protective equipment. Both Cow Parsnip and common parsnip, a yellow flowered version that is not native, may cause photosensitivity when their leaves are touched or broken open. Gloves are sufficient protection for humans. Leaves of both are dangerous to pets when touched or eaten. However, the common parsnip root is edible just like its close cousin the carrot. Another related plant is Queen Anne's Lace, which can cause irritation of the skin. One of the hallmarks of Giant Hogweed and Queen Anne’s Lace is the purple spotting of its stems, and hemlocks also exhibit this characteristic. Hemlocks (the herbaceous plant, not the tree of the same name) are poisonous but not phototoxic. 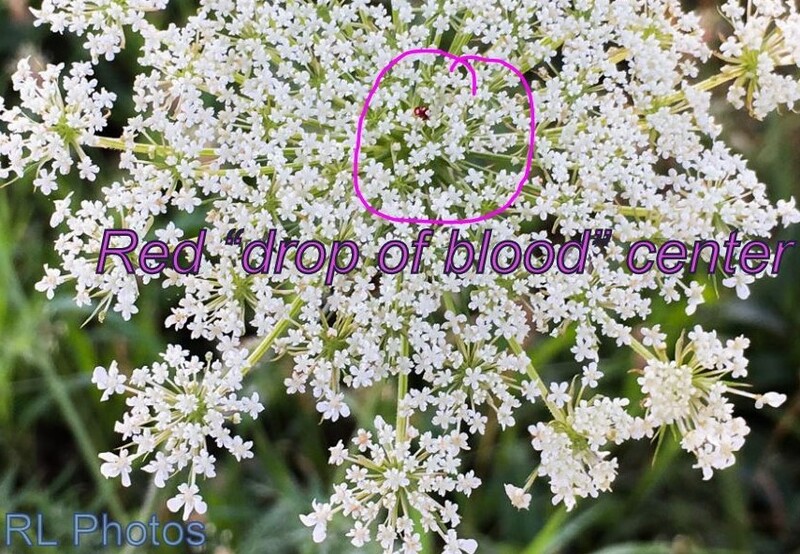 One way to tell the difference between Hemlock and Queen Anne's Lace is the “spot of blood" which is a tiny dark red center of the umbel seen in blooming Queen Anne's Lace plants. Another is that Queen Anne's Lace will have green whiskers all around the buds and flowers where the Hemlock plants do not. Sometimes older common names will specify an affected animal. When "bane" was used in a common name it meant that it was considered to be poisonous or toxic to the named animal. Water Hemlock is sometimes called Cowbane, poison parsnip or poison parsley. It is one of the most poisonous native plants in the USA and can cause fatal nervous system damage. Hemlock, a relative to Cowbane, was introduced to this country for its pretty flowers. See the references below for pictures and information from UT Extension publications. Nightshades are a diverse family of plants, including some that are deadly, some that cause discomfort after contact, and some that are not harmful at all. The benign group includes common food plants like tomatoes, eggplant, potatoes and peppers. The members of the Nightshade family that cause irritation often have common names that include the word nettle. Black Nightshade has edible purple fruit, but is easily mixed up with the more potent and dangerous "deadly nightshade" sometimes called belladonna. Unless you are sure of your ability to distinguish the edible plant from the dangerous plant, it is not advisable to tempt fate. No discussion of poisonous plants in East Tennessee would be complete without mentioning one of the most beautiful, the Datura. 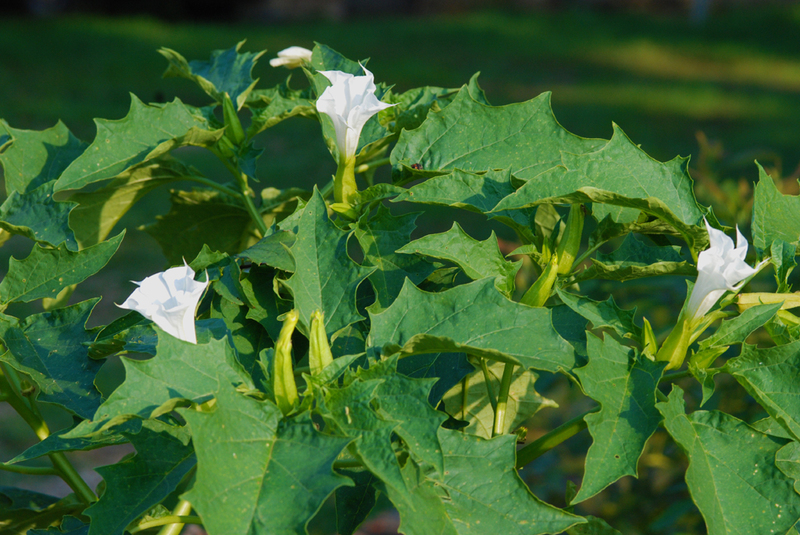 It has upright white trumpet flowers, broad leaves and prickly seed pods. While livestock are rarely poisoned in the field, due to the strong smell, they can be harmed if some is accidentally included in hay. It is poisonous to humans as well, but not always fatally so, and is used by Native Americans as a hallucinogenic. In Part 3 of this series we'll go over more painful and irritating plants. In Part 4 of this series we'll go over painful and poisonous critters.